Everyone has the ability to stick a sinker into the water and turn up trout. It’s one of the most common types of fish out there. Even a five year old can cast his line and spinner into the trout-filled water and catch something. If you are looking to catch more trout and more importantly, catch the bigger trout, then you are going to want to keep reading. Many anglers prefer spinners to lure the trout to take a bite. There are quite a few spinner lures on the market, so read our reviews to find out which ones are the best. This is a package deal. You get the three most popular colors and can pick the size that suits the game you seek. If it’s attractive to you, then you can be sure it’s attractive to the critters in the sea. The Panter Martin Holographic Spinning Lures have a unique shaft through blade design that results in the fastest and most consistent spinning activity in the sea. The blades send out special vibrations that the fish cannot resist. 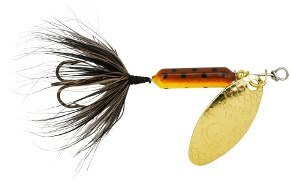 These spinners are heavy-weighted and made for catching the deeper divers. The three-prong hook design has only the sharpest points to keep the fish hooked. A holographic finish illuminates and sparkles in the water, thus drawing attention to your lure. The Yakima Bait Original Rooster Tail Lures have a major advantage in the water. The fish can’t see the hook shrouded behind the carefully colored blades. You can buy these in a variety of sizes and 135 finishes for any desired fishing targets. The vibrating tail draws fish to itself and offers unique spinning action that will compel fish to strike. These are very effective for small to medium size trout. If trout is what you seek, then you should buy a couple of these rooster tails and put them in your tackle box. If you are looking for a single lure that will transcend time, then this may be the lure for you. The Kastmaster is made from the finest brass and won’t bend, break or corrode. It will even retain its sheen after being regularly exposed to salt water. This lure is designed for catching trout, but is also good for a number of species including smallmouth bass and pickerel. The ultra-lite, light spinning and ice jigging supports a variety of water conditions and gives you all the action without the tangling or twisting of your line. The three-prong hook will ensure that your catch stays on the line in the toughest of fights. Trout is one of the most commonly sought after types of fish. It’s also one of the most prevalent. Whether you want a lot of action on your line or just mild action, these lures will have the fish tugging and have you singing praises to all your friends and family. Each brand offers unique advantages in both look and design, and each is made of the most durable materials for multiple uses. A lure doesn’t do its job if the only result is the attack of the fish- a good lure also keeps the fish hooked. Designed and tested by expert fishermen, you can’t go wrong with any of these trout lures.